MSMS is now accepting applications for a faculty position in Physics teacher for the 2019-2020 school year. MSMS is a public, residential high school for academically gifted and talented 11th and 12th grade students located on the campus of the Mississippi University for Women in Columbus, Mississippi. Master's Degree or above in Physics or related field. A Ph. D. is preferred. Five years of teaching experience at the secondary or post-secondary level. A valid Mississippi teaching license is desirable (endorsement 189). Salary is based upon the established position scale. Beginning salary ranges are from $54,587 to $57,859. The position is contracted for 190 days. Reporting data will be on or near August 2, 2019. Amber Lynn Moore, Senior Executive Assistant for MSMS at amoore@themsms.org or 662-329-7674. MSMS is now accepting applications for a faculty position in Mathematics for the 2019-2020 school year. The successful candidate will be prepared to teach English, Journalism and Creative Writing. MSMS is a public, residential high school for academically gifted and talented 11th and 12th grade students located on the campus of the Mississippi University for Women in Columbus, Misssissippi. Master's Degree or above in Mathematics. A Ph. D. is preferred. Five years of teaching experience at the secondary or post-secondary level. A valid Mississippi teaching license is desirable. The CPI Group, LLC provides a unique combination of staffing, HR consulting and team development strategies. They serve employers in Mississippi, Alabama and beyond. Currently, the CPI Group is looking for a full time bookkeeper to fulfill the needs of their staffing firm. Pay will start at $33,000 a year. Resume is required. All applicants must pass a drug screen and submit to a background check. To apply for this position, please email Donna Lang at ddove@cpi-group.com. Friendly City Express, a taxi and shuttle service that services the Golden Triangle and surrounding areas, is looking to hire drivers for their business. Drivers transport people in vans between locations including, but not limited to, airport travel. The ideal candidate should be friendly, flexible, and have a clean driving record. A military background is not required but being a veteran owned company they do support our veterans. BankTEL in Columbus is looking to hire a part-time position a couple days a week for their front desk. BankTEL Systems is the industry leader in compliant financial accounting software solutions. They help financial institutions cut costs, improve employee productivity, eliminate paper trails, and automate their internal processes. This position is for about 25-30 hours per week. JOB SUMMARY: Heritage Properties Incorporated is seeking a highly motivated, experienced assistant apartment manager at The Colony Apartment Homes, a 128-unit apartment community in Columbus, MS. If you have a proven track record of successful apartment operations, and enjoy working in a high volume office environment, Heritage Properties invites you to apply for this position. A minimum of 2 years of experience as in the apartment industry is required. Yardi / CRM / Rent Cafe experience is a huge plus! The pay rate for this position is $12/hr or more based on experience. To learn more about this position and its responsibilities, please visit https://easyapply.co/a/7af9b6b9-d420-4a7f-8738-52951c35ce0c. JOB SUMMARY: The Account Manager will work with the sales department to achieve goals and strategies set forth by management. WCBI is seeking an Account Manager that will develop and cultivate new business, grow existing business by selling marketing sollutions that produce measureable results for WCBI. Account Manager will have access to a suite of the most effective and efficient digital markeing and Broadcast TV products and Services. JOB SUMMARY: Arts & Crafts Manager at CAFB is responsible for the daily operation of the 14th FSS Arts and Crafts Center to ensure economic and efficient operations. Plans, schedules, and implements arts and crafts classes and events. Creates event schedules, observes work in progress and moniters production. May be required to teach various classes as needed. To read a full job description for the Arts and Crafts Center Manager, please click here. The pay rate for this position is $11.97-$16.77/hr. This position is posted on the link https://nafjobs.org/ where individuals should search by Columbus AFB. Cedarhill Animal Sanctuary is a non-profit organization in Caledonia, MS that is looking for an Assistant to the Executive Director. As an Assistant to the Executive Director, you will be responsible for raising money for the non-profit organization, increase donor base, and maintain all aspects of duties assigned. This position starts in March and the salary is $10/hr full time. Must be adept in handling all types of social media including Facebook, Instagram, YouTube, etc. Interested applicants should send their resume and cover letter to cedarhilldevelopment@gmail.com. Shift Leader: Manage team members, manage and control labor and food cost, manage the general operation of the store and serve guest in a fast and friendly manner. Requirements: Two ears of resaurant experience is required. TSA is now hiring Transportation Security Officers at the Golden Triangle Regional Aiport (GTR). This is a part time position, and the pay rate starts at $15.63 per hour. No experience is required PLUS TSA offers federal benefits such as health and life insurance coverage, a retirement plan, paid time off, and paid, ongoing training and more. Part-time job opportunity announcement closes on Monday, November 26, 2018. TSOs provide security and protection of air travelers, airports, and aircrafts in a courteous and professional manner. Interested candidates should apply HERE or call the TSA Help Desk at 877-872-7990 with any questions. This position is located at the Columbus, MS. Global Cellulose Fibers Mill. Responsibilities include: assisting mill maintenance leadership with clerical needs, coordinate mailroom requirements and manage office supplies, serve as Site Administrator for the mill's Gate Card/Genetec system, contract representative for site vendors such as uniforms, pest control and janitoril, coordinate and facilitate service awards and tier board awards ofr maintenance emploees. Requirements: Minimum of 5 years administrative support experience preferred, associates degree is also preferred, must have excellent PC skills including proficiency in Microsoft Outlook applications including Word, Excel, PowerPoint and Outlook, SAP experience preferred, excellent time management and prioritization skills required. Competencies: time management, planning, organizing and written communitcations. Camgian Microsystems is seeking a detail oriented & dependable Junior Analyst to support and help advance our Egburt Fintech product. The individual in this position will be a key Analyst to review the newly launched product images from visial cameras trained on target facilities. Primary responsibilities in the position will include dialy counting and classifying images as well as paying attention for changes in patterns that may be important. The role will work with closely with the Egburt production team in data collection and data quality assessment. JOB SUMMARY: Reporting to the Body Shop Manager, this person will work with trucks and buses by repairing and refinishing the framework. Click here for full job description. To Apply: Please download the Waters employment application available under the Career Opportunities tab at www.WatersTruck.com. Fill it out and email it to Randy Hudson at rhudson@waterstruck.com. JOB SUMMARY: Reporting to Service Manager, responsible for the efficient and safe pick up and delivery of customer vehicles to required destination. Click here for full job description. To Apply: Please download the Waters employment application available under the Career Opportunities tab at www.WatersTruck.com. Fill it out and email it to Gary Weaver at gweaver@waterstruck.com. JOB SUMMARY: Reporting to Parts Manager or designated manager, responsible for the selling of parts and accessories to wholesale and retail customers, interact with the dealership Service Department, and maintain the highest level of customer service. Click here for full job description. To Apply: Please download the Waters employment application under the Career Opportunities tab at www.WatersTruck.com. Fill it out and email it to Michael Waters at mwaters4@waterstruck.com. JOB SUMMARY: Repairs and maintains diesel engine industrial trucks according to dealership and factory specifications. Click here for full job description. JOB SUMMARY: Reporting to Parts Manager or designated manager, responsible for the selling of parts and accessories to wholesale and retail customers while maintaining the highest level of customer service. Click here for full job description. To Apply: Please download the Waters employment application available under the Career Opportunities tab at www.WatersTruck.com. Fill it out and email it to Michael Waters at mwaters4@waterstruck.com. This role is responsible for managing workflow through the office and ensuring that all tasks are completed in a timely manner. Coordinate workflow to maintain overall forward direction of the firm. Follow through on action steps resulting from prospect and client meeting (e.g., complete paperwork for investment and insurance products); provide ongoing support and service as appropriate. Assist advisor with marketing efforts, such as following up with referrals and updating contact management system. The Griffin Center has multiple entities under it which include Griffin Center for Cosmetic Surgery, Griffin Center for Oral and Maxillofacial Surgery, The Griffin Foundation, The Griffin Institute, and JEG Satellite Clinics. This position inquires marketing techniques for all entities, however the main focus would be on the Griffin Center for Cosmetic Surgery. In the last year we purchased a robot that performs a noninvasive hair transplant, which is the first of its kind in Mississippi. Someone who is a mover and shaker that can reap the full potential of this robot. We are very excited to have the first robotic hair transplant in our area and believe it will bring great success to our practice. I believe to make it as successful as possible, we must first start with a marketing major to advertise this procedure and get the word out. The position would have a base salary of approximately $35,000 with an incentive pay at 3% of collections for all cosmetic procedures. Comprehensive benefits package worth approx. $12,000 includes housing, meals, all utilites, cable TV, local phone service, internet connectivity, and full state employee benefits. The Mississippi School for Mathematics and Science is accepting application for the position of Residence Life Assistant Hall Director. This is a full-time, live-in position. The main responsibility of the Residence Life Assistant Hall Director is to develop a residential environment that is safe and conducive to learning. Assistant Hall Directors serve as administators for their building and act as mentors for their residents. The position requires a candidate who will develop and implement programs, counsel students, and discipline residents as needed. This position reports to the Hall Director of the building. Volume Freight "We have learned to adapt to our customers changing needs and over the years pride ourselves on having evolved with them. From dispatch, to maintenance, and office personnel, Volume Freight is staffed with leading industry professionals, all having many years experience in the transportation industry. We are proud of our team!" Apply Today: Do you have two years or more over-the-road experience and a clean driving record? Apply for a driving position now and join the Volume Freight Family. Duties: Work involves preparing professional layouts/graphics for flyers, brochures, posters, advertisements, newsletters and similar types of publications. Qualifications: Demonstrated experience in project management, desktop publishing applications including Corel Draw, In Design, Illustrator, Photoshop and Acrobat (Adobe Creative Suite CS4) in a PC environment. A Human Resources Manager is needed to work for a construction company in Meridian, MS. The HR Manager will be responsible for planning, directing and coordinating human resources management activities and maintain functions such as employee compensation, recruitment, personnel policies, and regulatory compliance. For Full Job description, click here. If you would like to apply for this position please email resume to Donna Dove. An IT Manager is needed to work for a construction company in Meridian, MS. The IT Manager will be responsible for creating the vision for future technology as well as lead the ongoing development, deployment and production support of our existing IT programs. For more information, click here. If you would like to apply for this position please email resume to Donna Dove. A Tier 1 Consultant is responsible for providing superior customer service in responding to and troubleshooting advanced customer technology related issues. This is a full-time position. The position offers a competitive salary and benefits (group health, supplemental insurance, Simple IRA, paid vacation, and more). Interested individuals should submit their current resume to careers@exceedtech.com. To see FULL Job Description go to Exceed Technologies Website. Will be working approximately 9 months. Will be responsible for gathering requirements to document business rules for software development projects, federal reporting, and grant applications. A minimum of 2 years of experience is required. Must be able to use Microsoft products, Atlassian products, IBM Jazz Solutions, and IBM Rational DOORS Next Generation. Please email resumes to Donna Dove. Must have at least a high school diploma, Able to work under stressful situations, Can learn and understand required operational procedures. No previous experience needed, we will train. Apply in person by bringing resume to 5380 Hwy 182 East, Columbus, MS.
James Pest Management also has openings at the Memphis office if the candidate is interested in relocating. Century 21 Doris Hardy and Associates is looking to hire a part-time remote social media specialist to manage the office social media platforms, carry out daily social media tasks, and train real estate agents on new social media industry trends. This candidate will work remotely and report to the Broker/Owner. This position is responsible for creating, writing and scheduling posts for all social media platforms. Additionally, the social media specialist will be monitoring posts for comments, as well as responding appropriately to online posted content. For a full job description, Click Here. To apply, send resume to socialmedia@dorishardy.com and also CC dhardy@dorishardy.com. Become a trusted communicator to thousands of loyal viewers, and chart the future of a show with 40 years of success behind it! 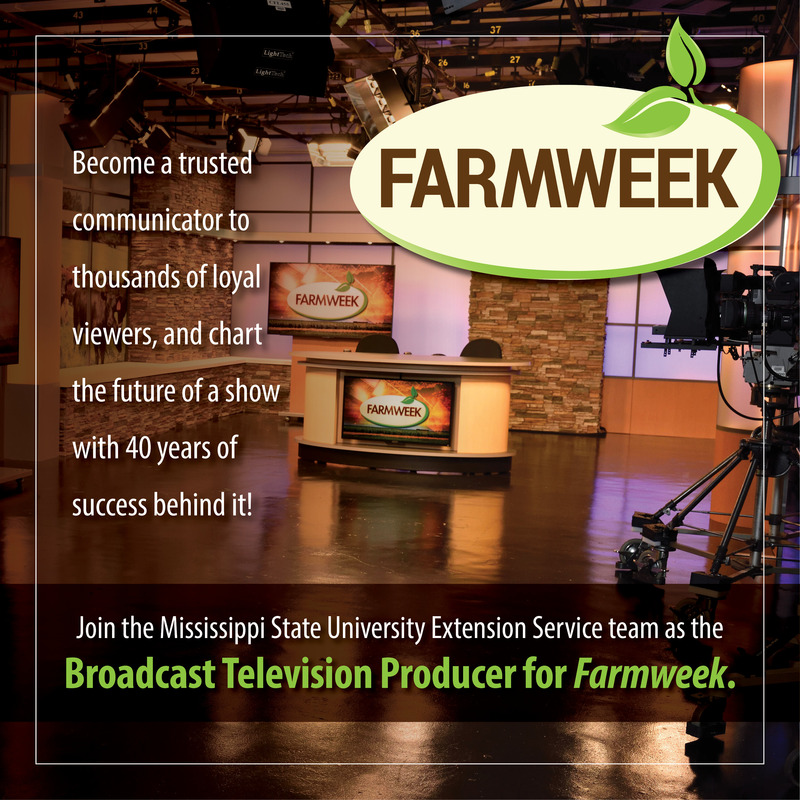 Join the Mississippi State University Extension Service team as the Broadcast Television Producer for Farmweek . For a full job description click here. To be considered for this position apply on www.jobs.msstate.edu.